Safety and peace of mind are included with every job. Don’t risk it! 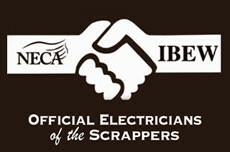 Use a NECA-IBEW Electricians contractor to help ensure safety. When you use NECA-IBEW Electricians contractors, you get professionals who can help you avoid potentially hazardous electrical situations. Improper electrical installations and maintenance are primary causes of home and business fires, which can result in great losses of money – and even lives. But our contractors make safety a priority, and our electricians are safety trained and skilled to make all installations as safe as they can be. According to the National Fire Protection Association, during a typical year, home electrical problems account for 67,800 fires, 485 deaths and $868 million in property losses in the United States. Home electrical wiring causes twice as many fires as electrical appliances. To avoid potentially disastrous situations, NECA-IBEW Electricians contractors review the state of your project to determine any safety hazards that might be present.